In an effort to become the most eco-friendly resort on the planet, Kirkwood Mountain Resort announced today that the Nevada Pipe Service Company will begin construction of the Trans-Nevada Oil Pipeline early this summer. 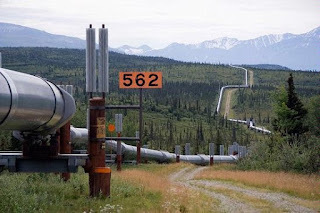 The oil pipeline will stretch just over 400 miles (1/2 the length of the Alaska pipeline) from Las Vegas to Kirkwood Mountain Resort and will transport recycled bio-diesel (fry-oil) from restaurants and casinos in Las Vegas to the diesel power plant located at Kirkwood. The bio-diesel will be used to fuel the generators that power entire the resort. Resort representatives said, since Kirkwood is off the grid, meaning the entire resort is self powered with Cat diesel generators, this presented a unique opportunity to run the resort entirely on fry oil. The single 12" pipe will be approx 40% buried and 60% above ground and feature 6 pumping stations. This is seen as a bold move by environmentalists, who welcome a new innovative approach to a greener Kirkwood and resort officials say they expect the oil pipeline to be completed and pumping oil by the winter of 2013. They expect the pipeline to pay for itself in about 10 years.